Ice cream in 10′, fantastic! You will love me for this recipe. I surely loved my Greek summer house neighbor for sharing it. Just when I thought that mydinnertoday would never host an ice-cream recipe (too much work), there came the simplest and yummiest ice-cream recipe in the world! The recipe calls for vegetal cream, which is a non-dairy heavy cream. Not sure what versions of it we get in the U.S. Most likely it’ll be fine to use regular heavy cream. I’ll let you know when I make it again in a week or so that we’ll be back home. If you are in Greece, don’t blink it, get some Papadopoulou biscuits, vegetal cream and a can of condensed milk and you’re almost done. How to make: Beat the vegetal cream lightly until it becomes fluffy. Don’t overbeat. It’s cream, so overbeating will turn it into liquid. In another bowl, beat the condensed milk lightly. Combine the milk with the cream and the vanilla. I beat them all for a second or two to combine well. Cover and put the bowl in the freezer for as long as it will take you to line up the biscuits. Take a regular sized, rectangular pyrex or other type container that can go in the freezer. Line up the biscuits, chocolate side up. Take the ice-cream out of the freezer and pour it over the biscuits. Line up another layer of biscuits, chocolate side down. Try your best that the alignment will be such that you’ll get a nice sandwich with ice-cream between two biscuits. Cover the pan with cling film and put it in the freezer. In an hour or two take it out, if you want, and “cut” the sandwiches to make them easier to come out nicely when it’s ready. Cover again, put back in the freezer and let it freeze for at least four hours. Serve to everybody’s delight! Notes and tips: In the bowl with the cream and milk you can add pulped strawberries, or banana, or chocolate chips to make different flavors. I haven’t tried those yet but will. Stay tuned. Post-post comment: I tried it with heavy cream and it worked! See Ice-cream in 5′, with dairy cream. 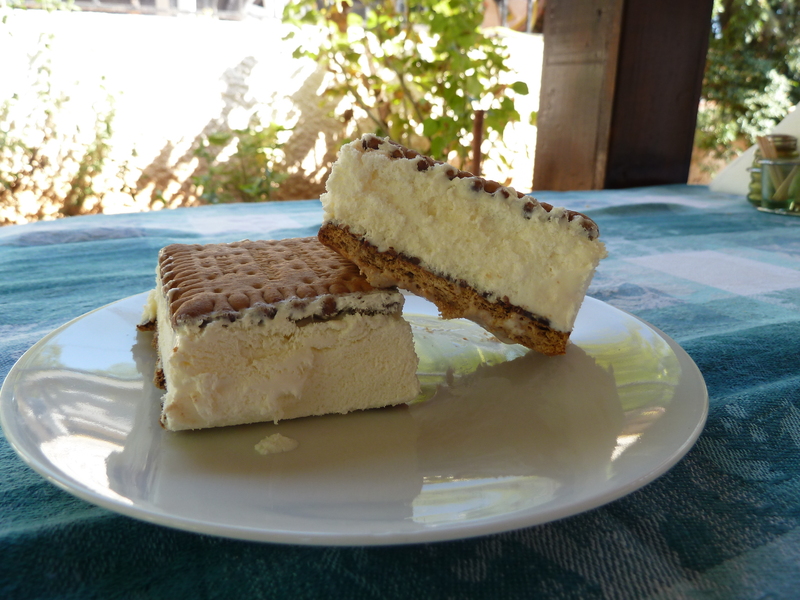 Really impressed: an ice-cream recipe without sugar! Bravo! I had a little problem implementing it last night: when I poured the liquid over the bottom bisquits, they happily floated! I had left the liquid about 15′ in the freezer – should I do it for longer? Well, not quite without sugar. 🙂 The condensed milk has plenty… About the floating biscuits, see my reply to your next comment. Glad you liked the recipe. It’s really cool. It was a disaster after all 😦 The cream crystallized in the freezer, have to leave it in room temperature for about an hour to be able to cut out a piece to taste it… It could be that I used dairy cream instead of vegetal… please help! You would love to have such a perfect ice-cream home-made!! Oh boy! Let’s troubleshoot. I just came back in the U.S. so I haven’t tried it with dairy heavy cream. One thing for you to do is to give it one more shot with vegetal cream. Since you are in GR it’s no problem at all. I found it in many supermarkets. In the meantime, I’ll try the dairy cream here and let you know how it went. In your other comment you mentioned the biscuits floating. That means that you either underbeat the cream so it didn’t get light and fluffy or you overbeat it and it became liquid again. When you get the vegetal be sure to beat it enough that it becomes fluffy. It won’t come out quite like chantilly but it will lighten up. Same with the condensed milk. Beat it before you mix it with the vegetal cream. Thanks for the support!! I now understand that by condensed you meant zaxarouxo and not evapore, which to be honest makes the recipe must less appealing due to my sugar abstinence 🙂 Filakia!!!! Oh, I see! So you used evaporated milk which, at least partly, explains why you ice-cream didn’t come out fluffy enough. Sorry about the misunderstanding. The biscuits would have sugar as well. Does splenda qualify as sugar substitute? It does. But what kind of milk would I use? Well, there’s several ways you can try to make your own. I haven’t ever tried making me own condensed milk but the simplest recipe I know to make a diet condensed milk is to beat 3/4 cup evaporated milk with 1 cup splenda and let it thicken in the fridge. I would add vanilla for flavor. It seems it is more common to use powdered milk, though, as in this recipe that combines 1/2 cup cold water, 1 1/3 cups powdered milk, 3/4 cup Splenda granular. And yet another version is to beat boiling water with splenda, then add the powdered milk and then in the fridge for thickening. If you do try any of these, let me know!! It doesn’t seem like a lot of work to make your own condensed milk, especially if the simple one with the evaporated milk works, but using splenda makes it substantially more expensive.